GOBankingRates reviewed the top 61 largest cities for population and employment growth, two indicators for real estate investment profitability. The top city for investing was Orlando, which holds the largest percentage of newcomers and employment growth. Chicago is one of the worst cities for investing due to a declining population and minimal home value increases. You may have what it takes to be a landlord, but is local market demand enough to provide a quick profit? GOBankingRates.com reviewed the 61 most populous cities in the nation to determine which offer the best conditions for real estate investing and cities with room to grow. To shape its rankings, the personal finance firm tracked annual growth in employment, population and home values, as well as the amount of time it would take rental income to pay off the area’s median single-family home value. The no. 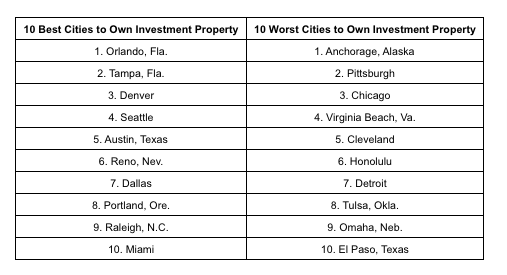 1 city for real estate investing is Orlando, according to the study. Orlando illustrated the largest increase in population growth since 2015, at 2.99 percent. Employment growth in Orlando, currently 4.5 percent, is also the highest compared to any other city surveyed. Despite home values rising 11 percent over the past year and helping property owners build equity quicker, it only takes 12.4 years to pay off a single-family home with rental income, the study shows. At no. 2, Tampa’s real estate market is on the rise annually, pushed by 2.51 percent population growth and 3.5 percent employment growth. Home values are up 11.6 percent, yet it would only take 9.66 years to pay off the median home value as a landlord. As the fifth best city for property investing, Austin’s employment growth is a high 4 percent since 2015. Population growth, too, has maintained an upward trajectory, at 2.09 percent year-over-year. Given incoming demand and a strong local economy, Austin home values are up 9.3 percent annually, according to the study. However, it would take a potential investor 18.81 years to pay off a median-priced home in Austin. Miami rounds out the top 10, with solid annual employment and population growth, at 2.7 percent and 2.23 percent, respectively. Despite Miami home values boosting 6.1 percent over the last year, it would only take 9.09 years to pay off a single-family home with rental income, according to GOBankingRates.com. Meanwhile, the study shows prospective landlords in Chicago don’t have the odds in their favor. The Windy City ranked third worst for investment property ownership, in part because of marginal employment growth of 1.3 percent and a 0.11 percent dip in population growth. Although it would take just over 10 years of rental income to pay off the median single-family home, values rose just 0.4 percent over the last year.